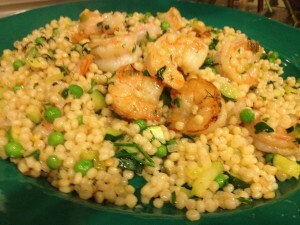 Contrary to popular belief, pearl couscous is a pasta, not a grain. I am always looking for interesting pasta or grain dishes to take to the pool or a cookout. Something easily transportable that will also keep well and provide the perfect vehicle for fresh vegetables and herbs from the garden. Thanks to Trader Joe’s and Whole Foods, home cooks now have access to interesting ancient grains and starches, including exotic stuff like quinoa, Burmese red rice, farro, spelt and barley. Pick up a box at your local Trader Joe’s. 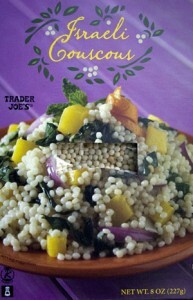 In my quest to expand my grain horizons, I bought a box of Israeli pearl couscous. The recipe on the back of the box looked tempting enough, but I thought I could doctor it up a bit to make it a main dish. 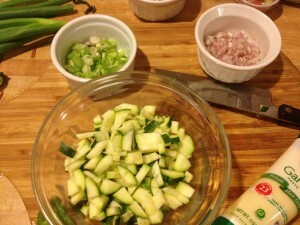 Chopped zucchini, green onions, and shallots. Photo by Rebecca Penovich. Melt 2 T. butter in large saute pan over medium heat. Add 1 T. chopped shallots, 1 T. chopped green onion, and 1 T. crushed garlic to the pan. Add 1 1/2 cups pearl couscous (the contents of the box) to the pan and saute until golden for 2 minutes, stirring frequently. Add 1 3/4 C. chicken broth and 1/2 tsp. salt and bring to a boil. Reduce heat to low, cover and simmer until liquid is absorbed and couscous is tender. At this point the pearl couscous will have the texture of risotto, but a bit chewier. In the same large saute pan, melt 2 T. butter over medium heat and when butter is sputtering, add 16 medium count peeled, fresh shrimp to the pan. Saute shrimp 2 minutes on each side (flipping once) until firm and pink (do not over-cook because you are going to put them back on the flame when mixed with the cooked couscous). 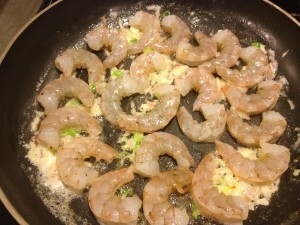 Pour the cooked shrimp and butter mixture over the cooked couscous and toss. In the same large saute pan, melt remaining 1 T.butter until sizzling and add remaining 1 T. chopped shallot, 1 T. crushed garlic, and 1 T. green onion. 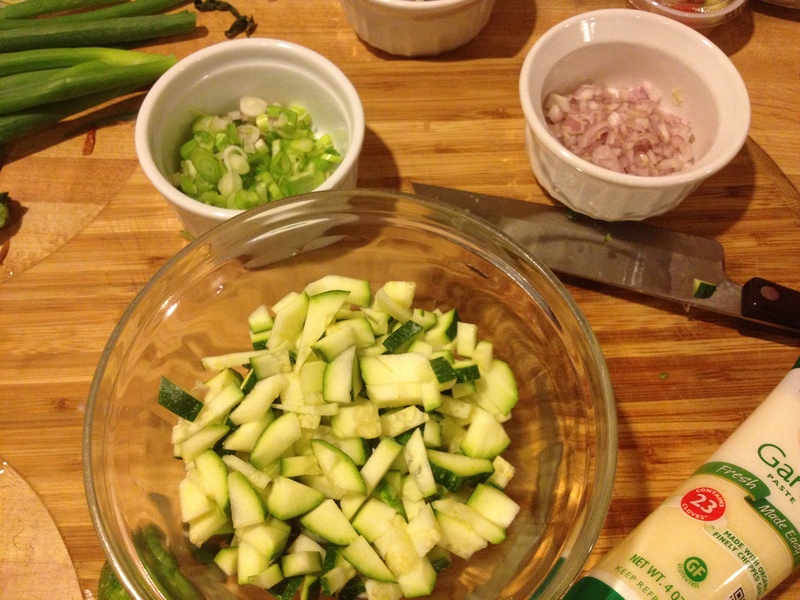 Add 1 C. chopped zucchini. Saute zucchini and aromatics for 4 minutes until zucchini is browned but not mushy. Squeeze 1 T. fresh lemon juice over sauteed zucchini and add the couscous and shrimp mixture back to the saute pan. Toss all together and add 1 C. of defrosted peas, 1/4 C. of chopped, fresh parsley and 2 T. of chopped fresh dill. Heat over low flame until peas are warm. Taste and adjust seasonings by adding remaining 1 T. lemon juice, lemon zest, and a pinch of kosher salt if needed.